Resistance to change is a natural human instinct, but one that can quickly derail projects with the best intentions. Implementing major new software, such as a Print MIS system, throughout a company can sometimes feel like a daunting task. To combat that, preparation and communication before decisions are made will quickly materialize acceptance and enthusiasm with employees. 1. Define and articulate the vision of what is trying to be achieved for the business. Begin the venture with an explanation of why the changes are necessary. Provide specific examples and keep the conversation going. Focus on the strategy, desired outcomes, helping people understand the bigger picture, and the reasons for the changes they are going to be asked to make. 2. 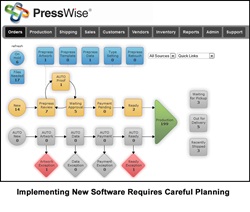 Analyze current processes at every step throughout the shop’s workflow. This is the time to utilize the team’s knowledge of their positions, and show them that their involvement in the process is key to success. Sit the team down and work through typical job workflows and elicit suggestions of how things could be done better. This collaborative approach can pay dividends down the road. 3. Create clear and measurable objectives that should be seen as a result of the implementation. Think about the workflow and the types of jobs that are often in progress. How fast do those jobs turn around? How many touches does a typical job take? What does this mean for the costs of production? Are there any types of jobs running at a loss? What kind of benchmarks should be used to quantify improvements? What kind of timeline is appropriate for the organization? 4. Appoint a project leader to not only drive implementation of the software, but also the change in peoples’ habits and actions. This isn’t a technology role, but a business role, so make sure they have a broad understanding of the entire operation. This person should be a natural leader, since they will need to convince others that this is the right thing for everyone. They will need to be able to clearly communicate the strategy, listen to others, and inspire them to be part of the process. 5. Be proactive throughout the implementation process. Set clear deadlines, make sure everyone involved has a set of learning and implementation tasks assigned to perform. Run weekly project meetings with the project leader and team to ensure deadlines are reached. 6. Don’t wait for 100% perfection before going live with the new system. We have all learned from past experience that business can be conducted with a less than perfect arrangement. Wrinkles will still need to be ironed out and other things will only come up once the software is working in a real-life environment. This is normal and should be built into the planning, expectations, and timelines. Implementing something as disruptive as a new MIS system across an entire shop is not something to be taken lightly. But, if the team is on board across the entire company and a clear set of actionable goals is outlined for the desired success, it should become a whole lot easier.